I am an eMeals blogger, and as such have received a complimentary subscription to their services. All opinions are my own, and I would never promote a service, brand, or item I have not tried myself or would not recommend to a member of my own family. Each New Year ushers in a new set of resolutions—oftentimes centered on improving your health and changing up less-than-desirable eating habits. Making changes, especially when involving food, can be challenging. The key to success is to start small. Here are 15 tips to get you—and your family—headed in the right direction. Before you know it, you’ll be feeling healthier and happier all the way around. Start The Morning Right—The old adage is true: Breakfast really is the most important meal of the day. Research shows that beginning your day with a nutritious breakfast rich in fiber and protein not only boosts your brain with the energy you need to face the day, but also helps you maintain a healthy weight. What’s more, for many families, breakfast has become the primary bonding meal of the day. Take Stock—A well-stocked refrigerator and pantry are critical to maintaining a healthy diet. Get rid of anything that’s expired or unhealthy, and then restock with more healthful staples like brown rice, dried beans, canned tuna and prepared pasta sauce for quick and nutritious meals. Keep containers of chopped fresh vegetables and fruit, and good-for-you, homemade snacks in the refrigerator to nibble between meals. • Beans and Peas: Legumes, including kidney beans, black beans, lima beans, black-eyed peas, chickpeas and lentils, are an excellent source of meat-free protein, fiber, folate and potassium. Diets high in beans and peas may help to reduce the risk of heart disease and prevent diabetes. • Dark Green, Leafy Vegetables: Kale, spinach, collard greens, turnip greens and mustard greens are excellent sources of fiber, folate, Vitamins A and K and antioxidants that contribute to heart and bone health and may help to prevent some forms of cancer. • Berries: Prized for their naturally sweet flavor, berries are also bursting with a host of healthy nutrients, including fiber; Vitamins A, C and E; calcium and potassium. The antioxidants in berries may help to reduce the risk of heart disease, diabetes and some kinds of cancer. • Broccoli and Cauliflower: Cruciferous vegetables, including Brussels sprouts and cabbage, contain powerful antioxidants that have been linked to reduced risk of several cancers. This group of vegetables is also low in calories and high in fiber and Vitamin C.
• Cinnamon: Polyphenols in cinnamon help to reduce inflammation in the body that can lead to heart disease and cancer. Sprinkle on oatmeal, coffee or toast for an added antioxidant boost. Cook with The Kids—Allow your kids to help prepare dinner by getting them involved with age-appropriate kitchen duties. The benefits are innumerable. Not only will they learn about the ingredients, healthy food and measurements, but they’ll also feel a sense of pride when happy eaters compliment them on a job well done. Plan Ahead—Say goodbye to the angst of having to decide what’s for dinner or making the drive-through the default by planning out your meals. You’ll save time and money—and eat healthier—when the week’s meals are planned ahead and all ingredients are combined into one, easy-to-use shopping list. Make Food Fun—Experiment with new cooking methods and flavors to keep healthy food doldrums at bay. Serve vegetables raw, cooked and puréed for a variety of textures. Cut vegetables and fruits into sticks or other handy shapes for kids. Thread florets or chunks onto skewers and serve with healthy dippers like salsa, hummus, yogurt or low-fat Ranch dressing (this works for grown-ups too). Don’t be afraid to try a weekly theme dinner—whether Taco Tuesday, Italian Wednesday or Asian Friday. This is a fun way to introduce new foods and flavors and create an enjoyable dinnertime environment. • Skip the heavy cream and “cream of” soups when making casseroles. Instead, whip up your own white sauce for a lighter, yet still creamy, base with far less fat and sodium. • Oven-frying allows you to enjoy the crispy, crunchy texture of fried foods without the added fat. Experiment with different breadings, like panko breadcrumbs, finely chopped nuts or flaked unsweetened coconut for a tropical touch. • Use mashed cauliflower, parsnips or turnips in place of carb-heavy potatoes as an alternate for this classic side dish. This easy strategy cuts calories while amping up the fiber and nutrients. Pile on the Veggies—The Dietary Guidelines for Americans recommends that we all need to eat more vegetables, which are naturally low in calories and high in hunger-curbing fiber. The best strategy: Fill half your plate with vegetables rather than calorie-rich carbs and meat. Add fresh or dried herbs and citrus zest or juice to veggies for extra flavor without adding extra calories. Be sure to visit local farmers’ markets when possible for the best selection of seasonal, just-picked produce. • Use leftovers to stretch your food budget and add variety to the lunchbox menu. Be creative with leftovers, and turn them into something new. Take leftover cooked pasta from last night and add some salad dressing and a few chopped veggies to make a quick pasta salad. Combine leftover cooked meat with fresh vegetables in a colorful spinach wrap. • For kids, use cookie cutters to make sandwiches into fun shapes like dinosaurs and hearts. Make miniature sandwiches using slider buns or mini bagels or prepare mini muffins. Kids love eating with their hands; smaller foods are much more fun to eat. Choose colorful fruits and veggies, and include dips like low-fat Ranch, salsa, peanut butter or hummus. Make your own protein- and calcium-packed dip with low-fat Greek yogurt. Try adding herbs for a veggie dip or cinnamon and honey for a quick and easy fruit dip. • Make lunch interactive. Pack an English muffin, marinara pizza sauce, cheese and different veggies for pizza, or pack corn tortillas, beans, cheese and salsa for tacos. Downsize Your Plate—If there’s one thing you can do to push your weight and health in the right direction, it’s controlling the amount of food you eat. We all tend to eat everything we put on our plates—and usually that’s way too much, especially when dining out. Remember, a standard serving of cooked meat is just 3 ounces—about the size of a deck of cards. If you’re worried that smaller portions will leave you unsatisfied, have no fear: A well-portioned diet should actually leave you feeling more energetic and truly satisfy your hunger. Go for Good Fats—While all fats (oils and butter included) contain comparable amounts of calories and total fat, the distribution of fats varies significantly. Banish butter and bacon grease and replace them with healthy fats like canola and olive oil—a key ingredient in the Mediterranean Diet, which may reduce your LDL (aka “bad”) cholesterol and lower your risk of developing heart disease. Switch to Low-Fat Dairy—Choose skim or 1% milk as your default, and go for low-fat yogurt, sour cream and cheese. Switch out heavy cream in soups and sauces for low-fat evaporated milk. Bonus Tip: Instead of using low-fat cheeses (which don’t always melt well and often lack flavor), use a smaller amount of flavorful, full-fat cheese. Go with (Whole) Grains—The Dietary Guidelines for Americans recommends making half your grains whole, so trade in refined grains like white rice, regular pasta and white bread for trendy whole grains like quinoa, farro, whole-wheat couscous (once found only in specialty stores, now easily found on most grocery store shelves). Swap Out Soda—All of the calories in soda and sugary drinks are empty calories, meaning they contribute no healthy nutrients. Switch soda for calorie-free beverages like water or sparkling water (add a splash of lemon or lime for flavor), or beverages with some nutritional value, like skim milk or small amounts of 100 percent fruit juice. • Promises weight loss of more than 1 pound per week: Weight loss of ½ to 1 pound per week is a practical goal and is best for your health. Setting a goal of losing weight more quickly will be hard to achieve, leaving you feeling defeated. Set yourself up for success by starting with an attainable goal. • Claims to change the way the body works: No one food, magical combination of foods, or supplement can change your genetic code or change the way the body processes food. Any diet that promises to “melt away fat” or cause your body to become a “fat-burning machine” is definitely too good to be true. • Advertises “no need to exercise:” Diet plans that promise you’ll lose weight quickly without exercise may sound appealing, but they’re taking the focus off living an overall healthy lifestyle. Exercise is a valuable tool in helping you achieve your weight-loss goals, plus it’s also good for your heart, can help maintain bone mass, and help prevent chronic diseases. 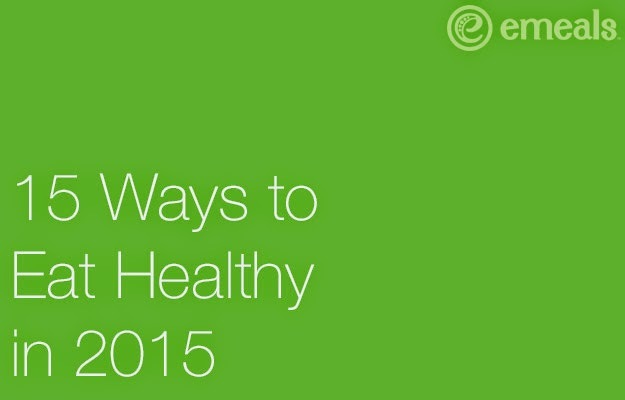 What tips would you add for keeping healthy in 2015? How do you get/keep your family on board with healthy changes you might make?